The interior design of this triplex in a 19th century limestone building in Upper East Side in Manhattan by Jonathan Adler has the delightful signature of the designer’s whimsical flair. The four bedroom four and half bath triplex has undergone a modern renovation by architect Richard Perry. With over 6,500 square feet of living space on three levels, this stunning luxury condo is listed at US$20 million. Barbie Malibu Dream House is a real life 3,500 square-foot house overlooking the Pacific Ocean in Malibu, California. 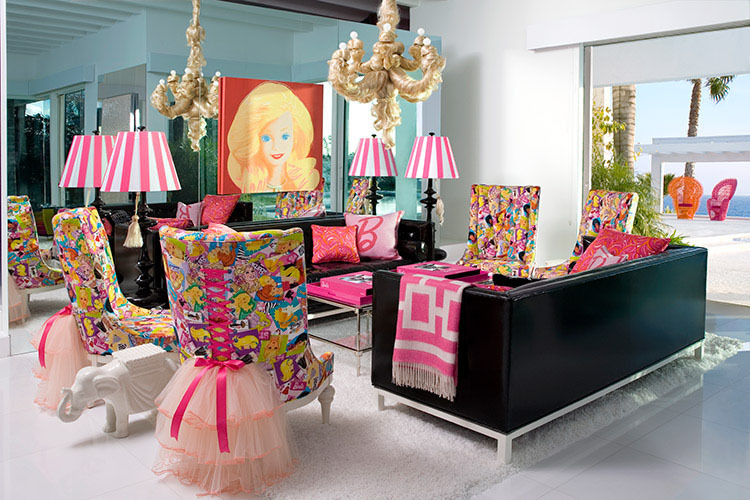 The interior design by Jonathan Adler, who was commissioned by toy maker Mattel to decorate the house for Barbie’s 50th birthday, is glamourous, chic and colourful. The living room features Barbie furniture and the bedroom has wall-to-wall pink carpeting emblazoned with her initial. The house even comes with a Malibu Barbie VW Beetle Convertible!